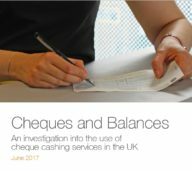 Cashing Out, the latest report from The RSA reveals the hidden costs and consequences of moving to a cashless society, including how bank branch closures pose risks to small businesses & low income families. We are looking to recruit a Financial Health Trainer, interested? We are looking for an enthusiastic and digitally skilled trainer to help us build content and deliver our financial health training programmes. This role will work with our Financial Health Learning Manager and other members of the team to identify new training needs, and design, produce and deliver training for intermediaries and end beneficiaries as our grant and contractual commitments require. The Financial Conduct Authority (FCA) have published their feedback statement on its review of high-cost credit, namely payday loans. © 2019 Financial Health Exchange. All Rights Reserved. Charity web design by Fat Beehive.